That is according to UFC president Dana White. Lesnar has been away from the octagon since 2016, when he beat Mark Hunt at UFC 200. However, that result was overturned after the 41-year-old failed two doping tests. He used to hold the UFC heavyweight title, but lost it in 2010 after being knocked out by Cain Velasquez. But the WWE universal champion has declared that he is interested in a fight with Cormier, who himself promised to retire earlier this year. Cormier became one of three UFC two-weight champions last year as he defeated Stipe Miocic for the heavyweight title, having already obtained the light-heavyweight belt due to a technicality with Jon Jones. 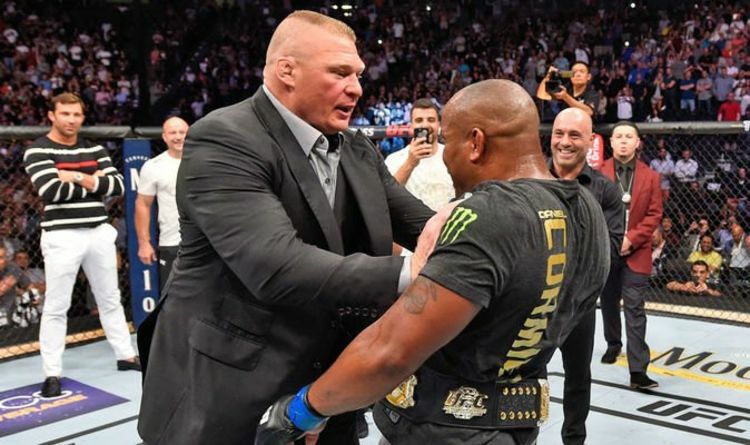 Whilst it was expected that he would walk away from the sport once he turned 40, White explained that Cormier wants to fight Lesnar this year. “Brock Lesnar is doing his thing with WWE,” the UFC president explained. “One of the things about Brock Lesnar is, when that guy is ready to fight, he is not shy. “He will call me and let me know. “And to be honest with you, I am hoping to hear from that guy this summer. “I think both guys really want it, Cormier wants it bad. “I know Cormier wants it bad, and Brock wants it bad. White also suggested that Cormier might actually want to keep fighting rather than retire. “I think it was more the people around Daniel Cormier that wanted him to retire than Daniel Cormier himself. “I always say this, if you even think about retirement you probably should. “But the reality is, Cormier is on top of his game, he’s the man, never been beaten at heavyweight, only beat by Jon Jones at light heavyweight.